Make a custom minimal Arduino board and program a blank ATmega168 or ATmega328 directly from the Arduino IDE. 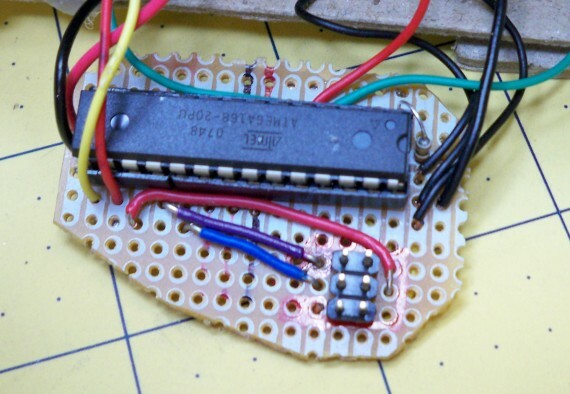 I have a custom Arduino board project to share including bonus steps at the end on how to program a blank ATmega168 or ATmega328 with your Arduino sketch directly from the Arduino IDE environment using an USBTinyISP programmer from Adafruit. I’m going to hack a Christmas photo frame I got a few years back when my son visited Santa Clause. The photo of him sitting on Santa’s knee came with a nice frame that had 5 LEDs that flashed when you turned it on. It ran on two AAs and used a “chip-on-board” to control the flashing pattern of the LEDs. The problem was that this thing flashed all 5 LEDs four times a second! We could never leave it on because it would drive you nuts. Ever since I purchased it I have wanted to hack it so the lighting was not so annoying. This is going to be mostly a video posting but I will put in some “how to” notes, helpful links, photos, circuit and code so it will be more useful to you for adding such a hack to a project of your own. Below is a video of me describing the problem and proposing the project. A few things did change after the video but I will note the changes below. Below is the original board from the photo frame. The “chip-on-board” is under the black blob. Comments Off on Make a custom minimal Arduino board and program a blank ATmega168 or ATmega328 directly from the Arduino IDE. You are currently browsing the ToddFun.com blog archives for January, 2011.